Starting Thursday, most U.S. health care providers must switch to a new system of computer codes for recording patient ailments. Opinions are mixed about the changes, but they are clearly fueling a greater demand for medical scribes, who focus on entering patient data. When Austin eye surgeon George Thorne sees patients, he is followed by a staff member who, for the most part, sits quietly behind him and takes notes. 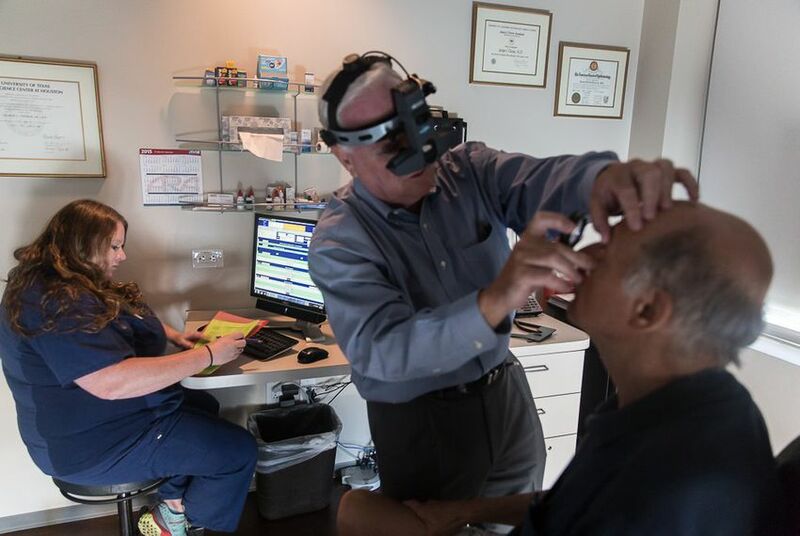 Shayla Martinez, certified as an ophthalmic technician, spends much of her workdays as a medical scribe, recording the information Thorne and other doctors collect from patients. She inputs that data into a computer program, helping the doctors stay up to date on the electronic health records that federal law requires them to keep. A few years ago, when those requirements were less demanding, Thorne was not accompanied by a scribe. "But we gave up on having the doctors do it all on the computer and see the patient because we couldn't get through the day” under the new regulations, he said. That didn’t come cheap. Thorne’s practice hired seven staff members to make sure there were enough scribes to handle the workload — one for each ophthalmologist. Now a new rule is coming into play. Starting Thursday, most U.S. health care providers must switch to a new system of computer codes for recording patient ailments — the 10th edition of the International Classification of Diseases. While some doctors worry that the new requirements are an expensive and disruptive set of government mandates, supporters say the new technology is long overdue. They say the upgrade will help keep patients from receiving expensive or harmful medical interventions by making it easier for doctors to share information about patients' histories. Regardless of the opinions on the new health records system, however, one business model is unquestionably booming because of them: medical scribes, and the companies that train them. Though scribes are not new to doctors' offices in Texas, so many physicians’ practices and emergency rooms are now hiring them that local staffing companies are expanding at breakneck pace, and at least one community college is offering a new program to get students certified to help doctors fill out the health records. A 2014 survey by the Texas Medical Association found that 21 percent of doctors used scribes — and that percentage has probably grown since then, experts say. Of those, 53 percent hired at least one new staff member to perform the scribe work. "The Scribe is the Dragon Slayer"
That's created an opportunity for scribes to bring greater efficiency to the health care sector, said Alex Geesbreght, president of PhysAssist, a medical scribe staffing company based in Fort Worth. He said he understands that electronic medical records, or EMRs, represent an administrative challenge for doctors — but he said their benefits to patient health outweigh any downside. And as doctors have switched over to the newer electronic systems, the demand for certified scribes — who must pass a test on patient privacy and typically earn $14 to $20 per hour — has risen precipitously. In 2008, Geesbreght’s company had just two corporate employees and 35 scribes. Now, he says, the company has more than 2,500 employees in 30 states. The idea behind the electronic health records is to help diverse players in the health care arena — doctors, hospitals, insurers and the like — share information so a patient receives the most cost-effective care. That way, for example, if a person is traveling and suffers from an illness far from home, the doctor who administers care can have access to important information about the patient's specific needs. Doctors like Thorne say scribes have made it easier for their practices to comply with the federal regulations for keeping electronic health records. But many say they would not have had to hire scribes in the first place if it weren’t for those rules, which they worry will cause disruption at doctors’ offices — and could result in higher costs for patients. Thursday’s rule change, which is separate from the Obama administration’s signature health law, is part of a larger policy push to bring higher technology into the health care sector. The new rule requires health care providers to switch to the computer code system known as ICD-10, which allows doctors to record patients’ ailments with a much higher degree of precision than the existing system, ICD-9. Supporters say the upgrade will allow providers to record crucial details — like the exact location of an injury — that older versions of the software were incapable of. But doctors’ groups have likened the change to an expensive headache — one that is forcing smaller family practices to close down because they can’t afford to hire more staff to navigate the burdensome regulation. The cost of the system's precision, critics say, is undue complexity. Some doctors have derided ICD-10 for its tens of thousands of codes that seem to span every conceivable affliction. A doctor or scribe can use specific codes for patients who get bitten by a cow, struck by a killer whale or injured in a collision with a person on roller skates, for example. “I hope patients will not notice any delays or changes in quality of care, but every doctor I’ve talked to is very, very worried” about the transition to ICD-10, Texas Medical Association president Tom Garcia said in a statement. At the federal level, doctors’ groups successfully led the charge to delay implementation of ICD-10 three times. But others have been eager to embrace the infusion of higher technology in the health care industry. Houston Community College is currently recruiting students for a six-month certificate program to train medical scribes, program director Cynthia Lundgren said. While medical scribes are not a new phenomenon, interest in hiring them has “certainly exploded” since the federal government in 2009 began offering cash incentives for doctors who effectively use electronic health records, said Nora Belcher, executive director of the Texas e-Health Alliance, which advocates for advancements in health information technology. The federal government rewards doctors who "meaningfully use" electronic health records to improve patient care in public insurance programs like Medicare and Medicaid. For patients on Medicare, the federal health insurer for the elderly, doctors can also be penalized if they aren’t using the electronic health records in a way the Obama administration approves of. That’s because the federal government, the nation’s biggest purchaser of health care services, wanted more data about the quality of care patients were receiving — because, "as a payer, you need to know what you're buying," Belcher said. But supporters say there are tremendous benefits for patients, too. For patients who must see multiple specialists, they say, a consolidated system of electronic records can help make complex medical conditions more manageable. "If you think about patients who have multiple medical conditions, I’ve seen patients carrying their medical records in a box," Belcher said. On a busy afternoon in Thorne's Austin office, Martinez takes notes on a desktop computer while the doctor calls out information about his patients' eyes from the exam chair. During a short break, Thorne says he sees the potential for electronic health records to improve population health by giving health care workers better access to data. “But any change is difficult, and this is not an insubstantial change," he said.